North Beach Camp Resort invites you to enjoy our location between the Atlantic Ocean and the North River, our very own scenic St. Augustine Cruises & Restaurant, plus the outdoor activities and facilities we have to offer. We are located along the East Florida’s serene Atlantic Ocean coast. Enjoy spectacular sunrises from our oceanside deck plus swimming, surfing and surf fishing! North Beach Camp Resort offers discounted tickets for St. Augustine Scenic Cruises. Cruise the waterways around St. Augustine aboard our very own ship, the Victory III. St. Augustine’s Original Sightseeing Cruise allows you to relax and enjoy a one hour and fifteen minute ride aboard a comfortable boat. Departing daily from the Municipal Marina, south of Bridge of Lions in the downtown area, the Captain provides a narrated tour of St. Augustine’s historic landmarks and natural beauty. Two Tasty St. Augustine Florida Restaurants! North Beach Camp Resort is lucky to have Aunt-Kate’s Restaurant on the property! This restaurant provides a great family, casual dining experience. 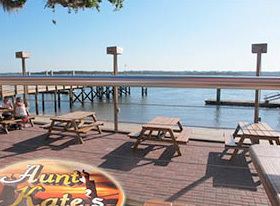 Continuing over 100 years of serving the finest in local seafood, Aunt Kate’s pleasures both the eye and the pallet! Situated in a grove of live oaks on the bank of the Tolomoto River, you can dine on the outside decks under the trees or inside in either the main dining room or the Victory Bar. North Beach Camp Resort is located next door to the casual, oceanfront dining of the The Reef Restaurant. Enjoy a lively menu of seafood, plus steaks, pastas, salads, innovative chef specials, an extensive wine list and full bar. Accolades for this dining experience include: “Best Sunday Brunch”, “Best Prime Rib in the Area”, “Finest Salmon Caesar Salad”, “Best Clam Chowder” in Florida” and more. The Reef Restaurant is open seven days a week, and offers indoor and outdoor deck dining, weekend entertainment, facilities for private functions, catering services, ample parking, excellent ocean views and hospitality that can’t be beat! 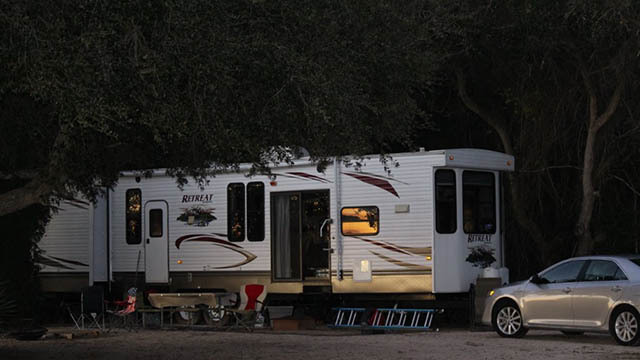 Experience the Difference of Camping at St. Augustine’s Finest Campground!